Last night I returned some library material to a branch that I don’t visit too often. 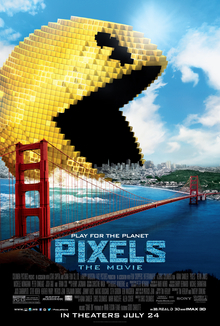 Browsing the DVD section I saw a fresh copy of Pixels. I’d been curious about it, so checked it out. I was drawn into the film fairly quickly. Being about 20 yrs in 1982, where the movie begins, it brought back a host of memories. Some good, some not so good. Adam Sandler plays Sam Brenner, a “loser” working as a tech installer. His orange outfit even has the word “nerd” in the corporate logo. Sort of a cliche these days, one which I doubt actual tech installers would appreciate. On the other hand, Sam takes on an attractive “snob” (Michelle Monaghan) who wouldn’t kiss him because of his lowly status. And he does it well. So the film is a bit more complicated than merely perpetuating harmful stereotypes. What really grabbed me in this movie was its integration of early video games, 80s pop culture, and the idea of an ET invasion. If you extend your imagination a bit, I think this movie is pretty good. I laughed here and there. Yes, drifted a few times… but one can always hit the pause button and get a coffee or snack when that happens. On the whole, I felt that Sandler and the supportive cast did a good job. I wouldn’t say “great” but again, it was the synthesis of old, new and the beyond that made the difference. More or less panned on other web sites. I think this film was just a bit too clever for some learned “critics” whose minds are too regimented to appreciate a flick that doesn’t fit into the current sci-fi box. True, it appears stupid and silly. One reviewer just called it “tediously bad.”¹ But something higher was going on. At least, it was for me. Final word – Pleasantly surprised.